nervous when reading a new-to-me author, but I really enjoyed this introduction to Golden Keyes Parsons. 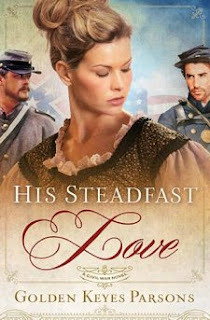 His Steadfast Love felt like I was watching Vivien Leigh in Gone With the Wind; and although Amanda is nothing like Scarlett O’Hara, many of the struggles, emotions, and even circumstances seemed much the same as I was immersed in the story. I loved the rich, historical detail, as well as pertinent quotes from leaders and writings of the era that Golden included at the beginning of each chapter. His Steadfast Love was an easy story to enjoy! Thank you to Golden and Thomas Nelson through Book Sneeze for sending me a copy to read and review!